Simon’s word? Or Jesus’ Word? So, there’s the Preacher’s Word: “Put out into the deep and let down your nets for a catch.” Implying: Trust ME. Then there’s the word of the licensed, bonded and certified fisherman: “Master, we toiled all night and took nothing!” Implying: I’m the casting and trawling expert. I’ve done this all my life. I own Big Water Adventure Fishing with James and John. No, I didn’t say Jimmy Houston or Babe Winkelman. Houston and Winkelman are JV team compared to my fishing buddies and me! Night fishing is when you catch fish. And you certainly don’t throw the nets into the deep water! Even an idiot knows that! Even though it goes against all his manly reason, fishing expertise and testosterone know-how Simon will do as Jesus says. Trust a lifetime of fishing logic and knowledge? Or trust Jesus and His Word? I wonder if Simon Peter decided to let down the nets just to prove that the Preacher was a fool, an imbecile, or a moron. Or is Simon putting all His trust in Jesus and what Jesus says? Even when it comes to fishing? Let’s run with that! Let’s put the best construction on Simon’s remark. I like that better. Simon Peter submits all his fishing expertise and knowledge to the Word of Jesus. “But at your word I will let down the nets.” That’s the faith point! “At your word!” This is remarkable! Astonishing! Joyfully so! Remember what we’ve been hearing the last three weeks this Epiphany season? What’s been the theme of this year’s Epiphany season? We’re on episode 5 this week! Jesus speaks, teaches and preaches THE WORD with AUTHORITY! In today’s text the Word of Jesus is the entire reason why people are gathered around Him (5:1). It’s why they are His hangers on! His trust-ers! His faith-ers! The authoritative Word of Jesus commandeered Peter’s boat (5:3). The authoritative Word of Jesus creatively produced – against all human reason and all angling knowhow — a huge catch of fish (5:4-7)! The authoritative Word of Jesus removed Peter’s immense fear when he fell at Jesus’ feet desperately aware of his utter sinfulness in the presence of the Lord of lords and King of kings who graciously and abundantly gives to an undeserving wretch like him (5:8)! The authoritative Word of Jesus summoned Simon, James and John into the apostolic ministry (5:10). The authoritative Word of Jesus produced in these three fishermen the ready will to leave everything behind (family, work, friends, fish, etc.) and follow Jesus in order to be used by Jesus to fish in a different way. A salvific fishing expedition! To salvationally catch or net sinners in the mesh of the gospel – the preaching that Jesus alone is the Savior of all sinners! Now, let’s back up just a bit. At first Simon called Jesus “master.” Then after the miraculous catch of fish because of the Word of Jesus, Peter calls Him “Lord.” Jesus is LORD! Simon’s life was never the same again! And His authoritative Word is what still runs His church. Consequently, little Arthur Watson was brought for holy baptism according to whose Word? Yes, that’s right! Christ the Lord’s! His Matthew 28:19 Word! When it comes to holy baptism we listen only to Lord Jesus. When He mandates that all nations be baptized in the Name of the Father and of the Son and of the Holy Spirit, we do it. As He bids us do. Even though all science, reason and experience tell us that holy baptism does and gives nothing. We instead listen to Preacher Jesus. He mandates it. So, like Simon, we say: “But at Your Word we will receive holy baptism.” At Your Word we have brought Arthur Watson for holy baptism. That’s the faith point. Trusting in Jesus and His Word! Then when we hear what Jesus abundantly and graciously gives in holy baptism, we’re blown away – JOYFULLY! In holy baptism God gives His Name. Did you hear that? I said that in holy baptism God gives His NAME! The NAME of the Father and of the Son and of the Holy Spirit is one of the most important gifts anyone can ever be given! 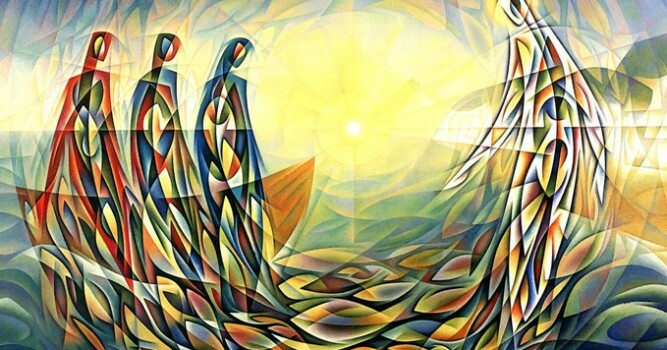 The divine gift of the TRIUNE NAME is what God Himself bestows in holy baptism. The Holy Trinity is actually and really there – GOD FOR YOU – as He gives you His NAME at the font. After all, God’s Name is synonymous with God Himself! When he gives you His Name He promises to be God for you and to always act as God for you. Not just passively being God for you as if He’s just twiddling His thumbs BUT actively giving Himself and all that He is FOR YOU in holy baptism. With His Name in holy baptism God the Father, God the Son and God the Holy Spirit promise to be God FOR YOU and to bless you with salvation. Yes, that’s right! I said it! Salvation. The “s” verb and God’s Name always go together. I’ll give you a few examples. Again note the “s” verb goes with God’s Name. Psalm 54:1 says: “O God, SAVE ME BY YOUR NAME.” Joel 2:32 is quoted by Peter in Acts 2:21. It says: “Everyone that calls on the NAME of the Lord shall be SAVED.” John 20:31 promises: “that by believing you may have life in his name.” Life here equals salvation! And salvation is in Jesus’ Name! In Acts 4:12 Peter preaches this: “there is salvation in no one else, for there is no other NAME under heaven given among men by which we must be SAVED.” One more for good measure. It’s Acts 10:43. Again, it’s another sermon from Peter. “To Jesus all the prophets bear witness that everyone who believes in him receives forgiveness of sins through his NAME.” Forgiveness is equivalent to salvation! There you have it. 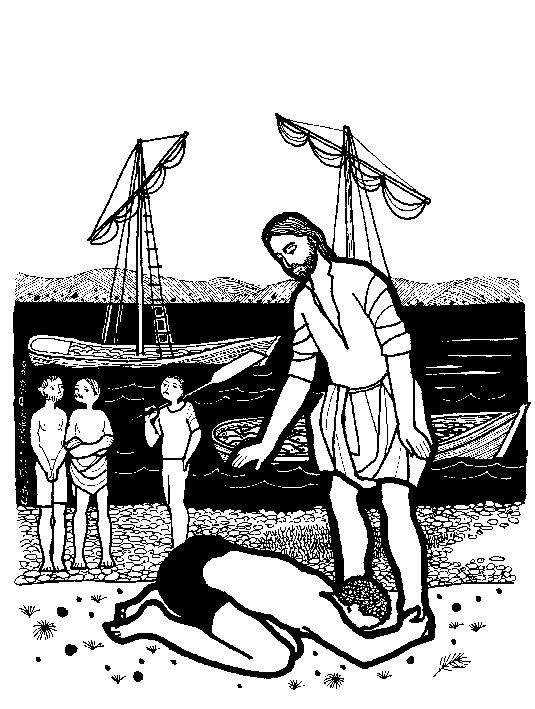 The Lord’s Word: “Put out into the deep and let down your nets for a catch.” Simon did! And what an epiphany! Preacher Jesus is the “Lord!” Simon’s confession that Jesus is not just “master” but “Lord” is our confession too! We’ve been given more to see than a huge catch of fish! With His Mt. 28:19 Word, “make disciples of all nations baptizing them in the name of the Father and of the Son and of the Holy Spirit,” the Lord Jesus has given you and today gave little Arthur Watson His divine and saving name. Again, I repeat, when God gives His name He delivers Christ’s Good Friday salvation. Jesus has netted you. Saved you and Arthur Watson. He says so. And your life is never the same again! What a wonderful epiphany!